Let’s face it, finding good Chinese food can be challenging in the suburbs. Lately, I’ve had some of the worst food from local Chinese restaurants and have declared being done with them completely. I’m currently in search of a good quality Chinese restaurant in the city (suggestions welcomed) that I would be more than happy to make the trip. So for now when I’m having that urge to order Chinese food I’ll turn to this simple recipe that always satisfy’s my craving. This no fail recipe of Sweet and Sour Chicken takes a few extra steps versus ordering take out, but is easier to make than you probably would assume. As I continue my search for that Chinese restaurant that wows, I’m going to keep making this amazing dish over and over again. 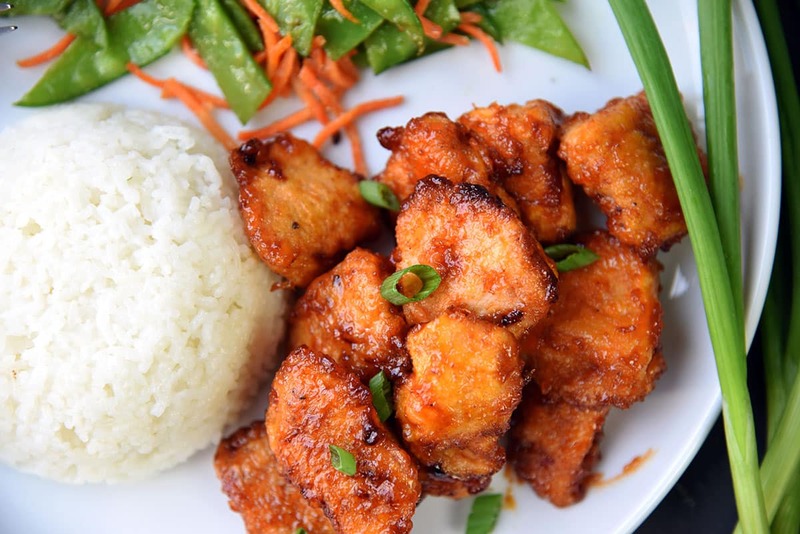 Serve this Sweet and Sour Chicken over rice of your choice. I prefer topping this sweet chicken with green onion for that extra crunch and to balance the sweetness. Soy Sauce is something I can not ever go with out when eating Chinese and this sweet chicken topped with salty soy is a combination to be savored. If you have never attempted to make a Chinese dish at home I’m challenging you to give this a shot and I know you will be pleasantly surprised. This is the second recipe of yours i have tried and i am impressed again! This was a bit time consuming with the frying of the chicken first, although i am sure it would go faster the 2nd time but WOW. Tastes slightly different than take out SNS chicken but BETTER. Lighter, fresher…Next time i would make some extra sauce, to pour over halfway through cooking. your recipes inspire me to keep trying new things! I am trying to expand my recipe rotations and this another to add. Boyfriend absolutely loved it. Delighted to have found you!! !